As we have recounted before on one of our early trips across Strasbourg there were no cycleways and in order to get away from the traffic we ended up carrying our bikes up steps and over a giant bridge in the harbour. Things are much better these days. There are any number of cycle paths and the city even has signposts pointing to the German town of of Kehl. One item that could be improved is better rail links to Mannheim and Frankfurt. After a high speed TGV trip from the South of France, it's still necessary to wait for the local train to Offenburg to catch an ICE north. We had an hour between changing trains at the central station a few weeks ago. 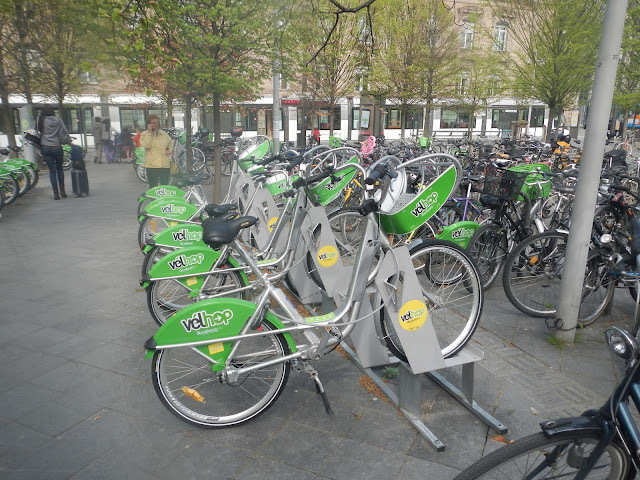 I checked out Vélhop, the Strasbourg cycle rental scheme which is similar to schemes in Paris, London and major German cities. The bikes seem to be sensible roadsters. You can pick them up at a number of points in the city both from automatic stations (1 € for an hour or 5 € for 12 hours) using a credit card as ID or from manned stations (one day for 5 € and 15 € for a week leaving a 150 € deposit and showing ID). The shops offer extras like helmets, baby seats and children's bicycles. There is more information under www.velhop.strasbourg.eu.